You are here: Home / Natural Fine Planetary Talismans / Unheated Sri Lankan Yellow Sapphire-The Gem of Benign Jupiter-The planet of Good luck, fortune and higher knowledge. 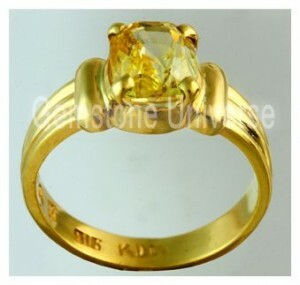 Yellow Sapphire the Gemstone of Jupiter set in 22KDM Gold ring. Unheated Sri Lankan Yellow Sapphire-The Gem of Benign Jupiter-The planet of Good luck, fortune and higher knowledge. Yellow Sapphire the Gemstone of Jupiter set in 22KDM Gold ring. Comments The yellow sapphire or the Pukhraj is the divine gemstone of the planet of good luck, fortune, peace and knowledge Jupiter also known as Guru or Brihaspati. On display here is a fine and super lustrous cushion cut unheated Yellow Sapphire from Sri Lanka representing the best of Jupiter energies. Could you tell me if this is still available and how soon can I get delivery? What K is the gold?